As part of the Schoolhouse Review Crew, I received a subscription to God’s World News. 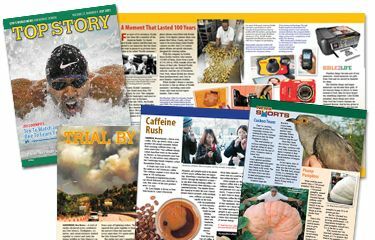 God’s World News provides six grade level publications for students to learn about the world around them from a Christian perspective. The six levels offered are PreK-Kindergarten, Grades 1-2, Grades 3-4, Grades 5-6, Middle School, and High School. I received the Middle School edition that I used with my 7th grade, 13 year old, son. The grade levels on the publications is a guide for age appropriate content. You can order the edition that is best suited for your child’s reading level. If you subscribe, and find that the edition you selected is not the best for your child, you can call and change your subscription to the grade level that you need. You can see samples of the magazines, lesson plans, biographies, and much more on the website to help you decide which grade level to go with. The Middle School level package, Top Story, includes a Map It! wall map, 10 full color, 32 page monthly issues (no issues in May & December), student access to God’s World Teens website, weekly parent/teacher emails, biographies & lessons available for download on the website, including quizzes and answer keys. Quizzes are not included in the summer issues. When articles in the magazine are talking about another country, many times there will be a small box with a map that says Map It!. The student can take the small map to the wall hung map to easily find that country. A great way to learn and reinforce world geography. The God’s World Teen website has some of the articles featured in the magazine, as well as online only content. There is also a website for kids, for the younger grades, so all the web content is age appropriate. The categories are SciTech, Must Know, Beliefs, Fun Stuff, Live Culture, and Arts. When the student clicks on a category across the top of the page, the page loads with stories for them to click on and read. The website is a great way for students to keep up to date on topics they are interested in. My son loves to be on the computer, so this website is a good fit for him. It reinforces what he has learned in the magazine, as well as providing new material for him to read. I subscribed to God’s World News about 20 years ago, when my two oldest were in elementary school. This is the first time I’ve used any of the issues with one of my four youngest. I’m not sure why. They really are a great supplement to use. I’m glad I was able to introduce God’s World News to my son. He loved reading them during the review period. I wouldn’t have to remind him. He would just go get it and read it himself. Sometimes getting boys to read can be very hard. Top Story held my sons interest. I love that I don’t have to worry about the content of the magazines. God’s World News single copy home subscriptions are $28 a year. There is a discount available for two or more subscriptions sent to the same address.